« Can “Paycheck Equity” be Mandated? For as long as anyone can remember New Hampshire (and most of New England and the Northeast) has had high energy prices compared to most other states. We may narrow the gap some but as sure as tomorrow will be Tuesday, compared to most other states and regions of the country, our energy prices will be higher. There are a number of reasons for that and they can’t be adequately covered here so for now let’s move on to the real concern of this post. Many will disagree with me about the prospects for relative energy costs in the state but even if I am wrong, and NH and New England could somehow be truly energy price competitive with the rest of the country, we are likely to be very disappointed in the resulting economic benefits. I am all for lowering energy prices and doing whatever we can do to accomplish that. Reducing energy costs will give households more discretionary income, ease the burden high energy prices place on many households, and benefit the cash flow of many businesses. These are real economic benefits but based on op-eds and comments about how high electricity and energy prices are killing business, including by people and groups I like and respect, you might think that reducing the price of electricity will bring a new industrial revolution to the state. The problem is, a new industrial revolution has been occurring and it is one that relies less on energy and is, in part, a result of those high energy prices. Energy prices are becoming less important to the success of the New Hampshire economy all the time. As the chart above shows, the energy content of what the state produces has been declining for decades. 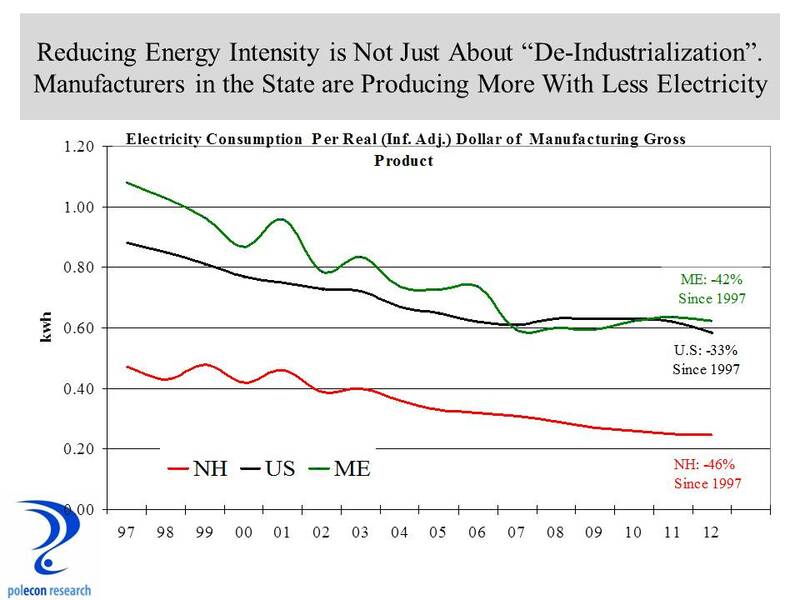 More of what we produce relies less on energy content and the lower energy intensity of the NH economy indicates a lower price or cost of converting energy into GDP. Reducing the price of an input that is becoming less important each year to the output of the NH economy is not a prescription for revitalizing the NH or any state’s economy. To cite just one example, high energy prices have hurt but certainly didn’t kill the pulp and paper industry in New Hampshire. Industrial electricity rates in Georgia are almost exactly one-half (5.97 cents/kwh) what they are in New Hampshire (11.97 cents/kwh avg. as of Dec. 2013) but Georgia lost 10,000 pulp and paper jobs (40% of the industry in that state) over the last 11 years. Industrial electricity rates are 40% lower in Wisconsin and Pennsylvania than they are in New Hampshire and those states lost 11,000 and 10,000 jobs respectively in paper-making industries. California lost more than 13,000 jobs in the paper industry, Illinois 12,000, Ohio 10,000 etc., etc. etc., to the tune of about 200,000 jobs lost across the country and in states with both high and low energy prices. So if you thought that lower electricity prices would reverse that industry you would be wrong. I hope NH does lower electricity prices and if we do, congratulations, we will have won a battle for the 1970’s and 1980’s. Maybe then we can turn our attention to the battle for the future. If you want an example of a NH paper company that is fighting (and winning) today’s and tomorrow’s battles consider Monadnock Paper, you can read an excellent online Forbes article about them here. The future is as much or more about reducing energy intensity as it is about lowering energy prices. 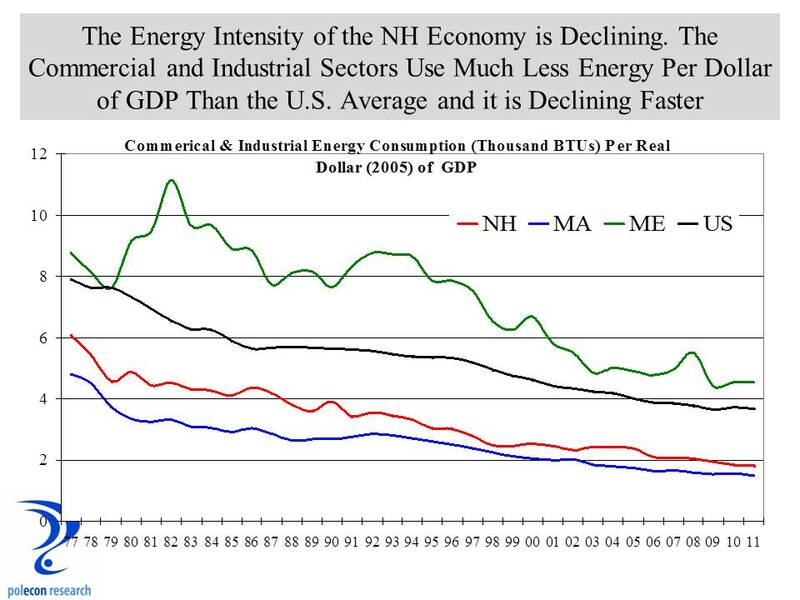 In fact, while lowering energy prices would have been great for NH circa 1980, it might also have delayed the long-term economic adjustments and reductions in energy intensity needed for our state and region to thrive. An industry that can’t thrive in NH because of energy prices is an industry that probably could not thrive in a global economy for a number of other cost-related reasons. 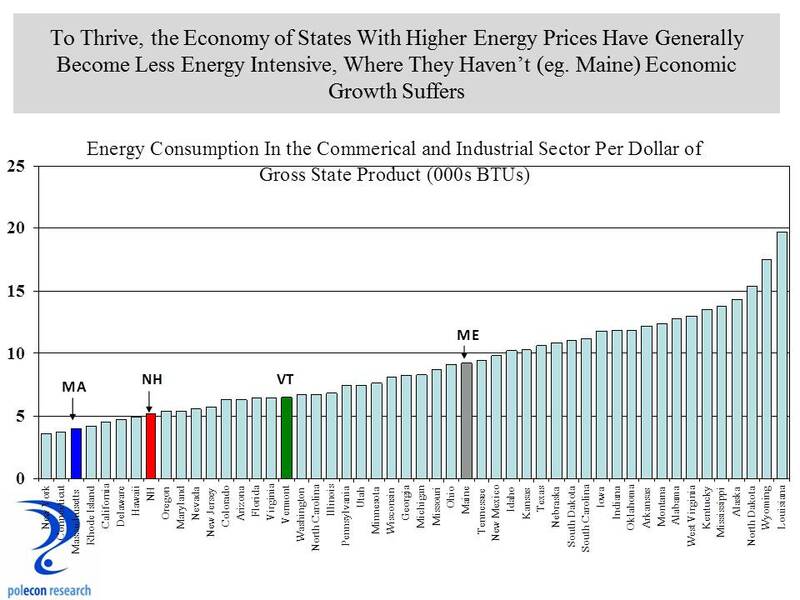 Maine’s industrial electricity prices are about one-third lower than they are in the rest of New England and I don’t think it is a coincidence that Maine is the only state in the region with an economy as energy intensive as the rest of the nation (chart below). Maine’s reliance on more energy intensive natural resource industries hasn’t served that state’s economy well in recent decades. Our state’s (and our region’s) comparative advantage will never be natural resources or lower costs such as electricity. For the most part, state economies have been adjusting to account for that fact in what has been at times a painful but necessary adjustment. 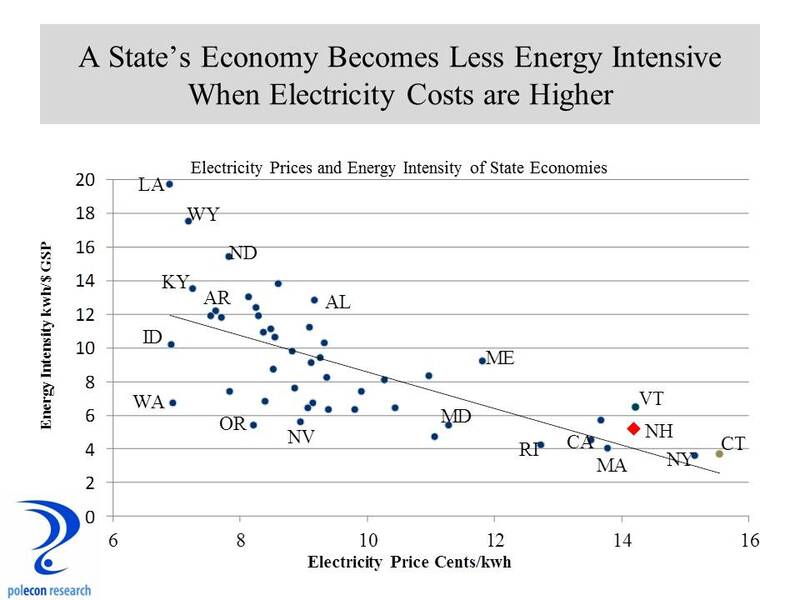 As the chart below shows, states with high electricity prices also generally use less electricity per dollar of gross state product. Although it can, becoming a less energy and electricity intensive economy does not just mean ‘de-industrializing” or becoming a more services-oriented economy. The dollar value of what New Hampshire’s manufacturers produce continues to climb in real dollars, they just do so just using less electricity every year. As the chart below shows, the electricity content per dollar of manufacturing output in the state continues to decline and it is not a coincidence that our manufacturing sector has been evolving from traditional to more advanced manufacturing. This entry was posted on March 24, 2014 at 10:39 am and is filed under Electricity, Energy, New Hampshire, NH Economy. You can subscribe via RSS 2.0 feed to this post's comments. Heard the breakfast forum last week was a success, Brian! Would have been there but am down south now. Do you see us gaining natural gas expansion or availability in near future? Think we have discussed. Just thought you might have newer insights. Way to rub it in on an end of March day when it is 23 degrees here. I think the economics are too compelling (gains for suppliers, owners of pipelines, but more importantly for consumers) for there not to be relief from some of the pipeline constraints that keep us from benefiting from the expanded U.S. supply of Nat gas. Pipelines are underground so you avoid those fights over aesthetics and the price impacts are more widespread and compelling than are those associated with other well know projects being contemplated. I also think that allows for more varied and available ways to finance pipeline projects. I am saving a snowball so heads-up when you return. Brian, I too am anxious for some pipeline projects sitting on the books to break loose! The (apparent) scarcities of fuel oil (e.g. failure of Fuller Oil in automatic deliveries) is troubling.